CVD is the major cause of morbidity and mortality for individuals with diabetes and the largest contributor to the direct and indirect costs of diabetes. Cardiovascular disease includes coronary disease, cerebrovascular disease, peripheral vascular disease and heart failure. The common conditions coexisting with type 2 diabetes (e.g., hypertension and dyslipidemia) are clear risk factors for CVD, and diabetes itself confers independent risk. There are three methods to evaluate the risk for cardiovascular disease including Framingham 10 year risk of general cardiovascular disease (2008 paper), Reynolds score for cardiovascular disease, and AHA method. See detail below. AHA score evaluation for cardiovascular disease. Before using these tools to evaluate your patient’s risk of cardiovascular disease, make sure you read and understand the notice and disclaimer. Hypertension is a common comorbidity of diabetes, affecting the majority of patients, with prevalence depending on type of diabetes, age, obesity, and ethnicity. Hypertension is a major risk factor for both CVD and microvascular complications. Elevated values should be confirmed on a separate day. Lower systolic targets, such as <130 mmHg, may be appropriate for certain individuals, such as younger patients, if can be achieved without undue treatment burden. Randomized clinical trials have demonstrated the benefit (reduction of CHD events, stroke, and nephropathy) of lowering blood pressure to <140 mmHg systolic and <80 mmHg diastolic in individuals with diabetes. However, the evidence for benefits from lower systolic blood pressure target is limited. The ACCORD trial examined whether blood pressure lowering to systolic blood pressure <120 mmHg provides greater cardiovascular protection than a systolic blood pressure level of 130-140 mmHg in patients with type 2 diabetes at high risk for CVD. The hazard ratio for the primary end point (nonfatal MI, nonfatal stroke, and CVD death) in the intensive group was 0.88. Of the prespecified secondary end points, only stroke and nonfatal stroke were statistically significantly reduced by intensive blood pressure treatment, with a hazard ratio of 0.59 and 0.63, respectively. Note that the clear body of evidence that systolic blood pressure over 140 mmHg is harmful suggests that clinicians should promptly initiate and titrate therapy in an ongoing fashion to achieve and maintain systolic blood pressure below 140 mmHg in virtually all patients. Additionally, patients with long life expectancy or those in whom stroke risk is a concern might, as part of shared decision making, appropriately have lower systolic targets such as <130 mmHg. This would especially be the case if this can be achieved with few drugs and without side effects of therapy. In nondiabetic individuals with elevated blood pressure, diet and exercise has been shown as effective as pharmacological monotherapy. Patients with a blood pressure >120/80 mmHg, lifestyle changes to reduce blood pressure are advised. For diabetic individuals with mildly elevated blood pressure (systolic blood pressure >120 mmHg or diastolic blood pressure >80 mmHg), although there are no well-controlled studies to prove lifestyle therapy on prevention of the diabetes complication of CVD, this nonpharmacological therapy is reasonalbe approach. If the blood pressure is confirmed to be ≥140 mmHg systolic and/or ≥80 mmHg diastolic, pharmacological therapy should be initiated along with nonpharmacological therapy. Lowering of blood pressure with regimens based on a variety of antihypertensive drugs, including ACE inhibitors, ARBs, β-blockers, diuretics, and calcium channel blockers, has been shown to be effective in reducing cardiovascular events. Several studies suggested that ACE inhibitors may be superior to dihydropyridine calcium channel blockers in reducing cardiovascular events. But a variety of other studies have shown no specific advantage to ACE inhibitors as initial treatment of hypertension in the general hypertensive population. In cohorts with diabetes, inhibitors of the renin-angiotensin system (RAS) may have unique advantages for initial or early therapy of hypertension. In a nonhypertension trial of high-risk individuals, including a larger subset with diabetes, an ACE inhibitor reduced CVD outcomes. In patients with congestive heart failure (CHF), including diabetic subgroups, ARBs have been shown to reduce major CVD outcomes, and in type 2 diabetic patients with significant nephropathy, ARBs were superior to calcium channel blockers for reducing heart failure. Thus, pharmacological therapy for patients with diabetes and hypertension should be with a regimen that includes either an ACE inhibitor or an angiotensin receptor blocker (ARB). If one class is not tolerated, the other should be substituted. Due to growing evidence suggesting that there is an association between increase in sleep-time blood pressure and incidence of CVD events, it is recommended that antihypertensive medication being given at bedtime. Patients with type 2 diabetes have an increased prevalence of lipid abnormalities, contributing to their high risk of CVD. Multiple clinical trials demonstrated significant effects of pharmacological therapy on CVD outcomes in subjects with CHD and for primary CVD prevention. 1.For most patients with diabetes, the first priority of dyslipidemia therapy (unless severe hypertriglyceridemia with risk of pancreatitis is the immediate issue) is to lower LDL cholesterol to a target goal of <100 mg/dL (2.60 mmol/L). 2.A reduction in LDL cholesterol to a goal of <70 mg/dL is an option in very high-risk diabetic patients with overt CVD. 3.LDL cholesterol lowering of the magnitude of 30-40% from baseline is an acceptable outcome for patients who cannot reach LDL cholesterol goals due to severe baseline elevations in LDL cholesterol and/or intolerance of maximal, or any, statin doses. But also, those with baseline LDL cholesterol minimally above 100 mg/dL, to lower the level about 30-40% from baseline is probably more effective than to just lower it slightly below 100 mg/dL. 4.Severe hypertriglyceridemia (>1,000 mg/dL) may warrant immediate pharmacological therapy (fibric acid derivative, niacin, or fish oil) to reduce the risk of acute pancreatitis. In the absence of severe hypertriglyceridemia, therapy targeting HDL cholesterol or triglycerides lacks the strong evidence base of statin therapy. Life-style intervention, including MNT, increased physical activity, weight loss, and smoking cessation, may allow some patients to reach lipid goals. In those with clinical CVD or over age 40 years with other CVD risk factors, pharmacological treatment should be added to lifestyle therapy regardless of basline lipid levels. Statins are the drugs of choice for LDL cholesterol lowering and cardioprotection. In patients other than those described above, statin treatment should be considered if there is an inadequate LDL cholesterol response to lifestyle modifications and improved glucose control, or if the patient has increased cardiovascualr risk (e.g., multiple cardiovascular risk factors or long duration of diabetes). If initial attempts to prescribe a statin leads to side effects, clinicians should attempt to find a dose or alternative statin that the patient can tolerate. When maximally tolerated doses of statins fail to significantly lower LDL cholesterol (<30% reduction from the patient’s baseline), there is no strong evidence that combination therapy should be used to achieve additional LDL cholesterol lowering. Niacin, fenofibrate, ezetimibe, and bile acid sequestrants all offer additional LDL cholesterol lowering to statins alone, but without evidence that such combination therapy for LDL cholesterol lowering provides a significant increment in CVD risk reduction over stain therapy alone. Therapy for multiple myeloma (MM) has advanced with gratifying speed over the past 5 to 7 years and with this progress, a degree of uncertainty has arisen about optimal approaches to therapy, particularly in the newly diagnosed patients. Indeed, using mordern therapeutic strategies, living with MM for a decade or longer has now become a reality for a significant proportion of patients. MM is characterized by neoplastic proliferation of plasma cells involving more than 10% of the bone marrow. Increasing evidence suggests that the bone marrow microenvironment of tumor cells plays a pivotal role in the pathogenesis of myelomas. 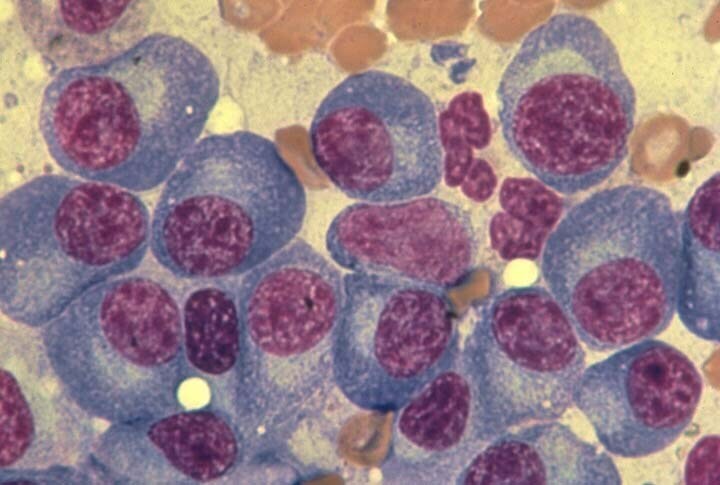 The malignant cells of MM, plasma cells, and plasmacytoid lymphocytes are the most mature cells of B-lymphocytes. B-cell maturation is associated with a programmed rearrangement of DNA sequences in the process of encoding the structure of mature immunoglobulins. It is characterized by overproduction of monoclonal immunoglobulin G (IgG), immunoglobulin A (IgA), and/or light chains, which may be identified with serum protein electrophoresis (SPEP) or urine protein electrophoresis (UPEP). The role of cytokines in the pathogenesis of MM is an important area of research. Interleukin (IL)–6 is also an important factor promoting the in vitro growth of myeloma cells. Other cytokines are tumor necrosis factor and IL-1b. The pathophysiologic basis for the clinical sequelae of MM involves the skeletal, hematologic, renal, and nervous systems, as well as general processes. Plasma-cell proliferation causes extensive skeletal destruction with osteolytic lesions, anemia, and hypercalcemia. Mechanisms for hypercalcemia include bony involvement and, possibly, humoral mechanisms. Isolated plasmacytomas (which affect 2-10% of patients) lead to hypercalcemia through production of the osteoclast-activating factor. Destruction of bone and its replacement by tumor may lead to pain, spinal cord compression, and pathologic fracture. The mechanism of spinal cord compression symptoms may be the development of an epidural mass with compression, a compression fracture of a vertebral body destroyed by multiple myeloma, or, rarely, an extradural mass. With pathologic fracture, bony involvement is typically lytic in nature. Bone marrow infiltration by plasma cells results in neutropenia, anemia, andthrombocytopenia. In terms of bleeding, M components may interact specifically with clotting factors, leading to defective aggregation. The most common mechanisms of renal injury in MM are direct tubular injury, amyloidosis, or involvement by plasmacytoma. [14, 15] Renal conditions that may be observed include hypercalcemic nephropathy, hyperuricemia due to renal infiltration of plasma cells resulting in myeloma, light-chain nephropathy,amyloidosis, and glomerulosclerosis. The nervous system may be involved as a result of radiculopathy and/or cord compression due to nerve compression and skeletal destruction (amyloid infiltration of nerves). General pathophysiologic processes include hyperviscosity syndrome. This syndrome is infrequent in MM and occurs with IgG1, IgG3, or IgA. MM may involve sludging in the capillaries, which results in purpura, retinal hemorrhage, papilledema, coronary ischemia, or central nervous system (CNS) symptoms (eg, confusion, vertigo, seizure). Cryoglobulinemia causes Raynaud phenomenon, thrombosis, and gangrene in the extremities. Some tests can afford important prognostic information and the subtypes of myeloma. These tests include classic CRAB measurements (calcium level, renal function, amemia, bone damage) , β2-microglobulin, albumin, lactate dehydrogenase (LDH), serum and urine monoclonal protein (24-hour) such as serum protein electrophoresis (SPEP), serum immunofixation electrophoresis (SIFE), 24 h urine protein electrophoresis (UPEP), urine immunofixation electrophoresis (UIFE), and so on, serum-free light chain assay. Bone marrow examinations such as morphology, FISH (fluorescent in situ hybridization) analysis of key genetic events, metaphase cytogenetics are also mandatory at present. Table 1. Genetic Tests to Be Performed in Myeloma Patients at Diagnosis. With these tests, multiple myeloma can be divided into three subtypes, which are solitary plasmacytoma, smoldering myeloma (asymptomatic myeloma) and active myeloma (symptomatic myeloma). According to the latest NCCN guideline MM can be categorized into three subgroups including solitary plasmacytoma, smoldering myeloma (asymptomatic), and active myeloma (symptomatic). Solitary plasmacytoma is a large solitary focus of plasma cell proliferation. To simplify, solitary plasmacytomas can be divided into 2 groups according to location: Plasmacytoma of the skeletal system (SBP) or Extramedullary plasmacytoma (EMP). Similarly, the latest NCCN guideline for MM categorizes solitary plasmacytoma into solitary osseous or solitary extraosseous. No related organ or tissue impairment (no end organ damage, including bone lesions) or symptoms. Note that the M-protein refers to the monoclonal protein produced by MM cells. In the section of management of MM we will discuss the specific therapeutic approaches for these three subtypes of MM. Several factors can afford important prognostic information for multiple myeloma. They are β2-microglobulin, lactate dehydrogenase (LDH), cytogenetics, and plasma cell-specific FISH analysis (hyperdiploidy, t(4;14)(p16;q32), t(14;16)(q32;q23), 17p13, t (11;14)(q13;q32), 1q amplifications, 1p deletions, loss of 12p, gains of Cr5). Of note that in the latest NCCN guideline about multiple myeloma several high-risk chromosomal aberrations in MM locates at 14q32, including three main ones that are t(11;14)(q13;q32), t(4;14)(p16;q32) and t(14;16)(q32;q23). Thus the risk incidence of t(11;14) is inconsistent with what was decribed in Table 2. And pay attention that patients with t(4;14), β2 microglobulin <4 mg/L and hemoglobin ≥10 g/dL may have intermediate risk disease. Although the genetics can afford the prognosis of multiple myeloma, this approach still needs more evidence. At present the method is still the Durie-Salmon criteria or ISS criteria. As shown in the table 2 at left, the stage of multiple myeloma can be divided into three periods: stage I, stage II, and stage III. For those patients with osseous plasmacytoma, primary radiation therapy (45 Gy or more) to the involved field is the initial treatment and is potentially curative. Extraosseous plasmacytomas are treated initially with radiation therapy (45 Gy or more) to the involved field followed by surgery if necessary. After radiation thearpy, patients with solitary plasmacytoma need follow-up. Blood and urine tests performed every 4 weeks initially to monitor response to the primary radiation therapy. If the patient achieves complete disappearance of the paraprotein then the frequency could be reduced to every 3-6 months or as indicated clinically. If the protein persists, then the monitoring should continue every 4 weeks. These tests include CBC, serum chemistry and those listed in the section of workup. If progressive disease emerges, then the patient should be re-evaluated for recurrent plasmacytoma or myeloma, and systemic therapy administered as indicated. Although the activity of novel agents has advanced to the point that early interventions are now being explored in clinical trials for smoldering myeloma, there is still no evidence that early treatment will improve survival in asymptomatic and biochemically stable patients. A critical point is that up to 25% of smoldering myeloma patients will not require active treatment for 10 to 15 years. However, the majority will indeed progress during that time. Once diagnosed, smoldering myeloma patients require frequent monitoring to allow treatment to begin before end-organ damage is evident. These tests are similar with solitary plasmacytoma, which are listed in the section of workup. If the disease progresses to symptomatic myeloma, these patients should be managed as active/symptomatic myeloma. We will discuss the management of active/symptomatic myeloma below. If the patients with MM progresse to active/symptomatic myeloma. Treatment should be initiated. Generally, we divide the treatment strategy into initial drug therapy, hematopoietic cell transplantation, and consolidation and maintenance thearpy after transplantation. There is a growing body of evidence showing an association between depth of response to therapy and improved long-term outcomes, including progressive-free survival (PFS) and overall survival (OS), in MM patients. Using conventional chemotherapy, it has been shown that there is a correlation between response before and after transplantation and that the quality of response after transplantation has a marked impact on outcome. Importantly, studies suggest that if a patient achieves a complete response (CR), this must be durable and that the duration of CR is the best predictor of OS. However, some special cases makes the view that initially obtaining a CR in predicting long-term outcome questionable, for instance, group of rapidly responding but early relapsing patients, group of more indolent myelomas that revert to an “monoclonal gammopathy of uncertain significance like” profile after therapy, and group of myeloma patients with stable nonprogressive disease after induction therapy. Although success and long-term remission have been achieved in many transplantation-eligible patients using limited treatment regimens, such as thalidomide/dexamethasone, bortezomib/dexamethasone, and lenalidomide/dexamethasone, complete and very good partial response (VGPR) rates can be substantially increased by combining these various drugs in triplets or even using 4 drugs together. CVRD: cyclosphamide, bortezomib, lenalidomide, and dexamethasone. A note of caution is that many of these studies are based on relatively small numbers of patients at single, or limited numbers, of centers, but cumulatively the message is consistent, with frequent, rapid, and deep responses seen. Althought response rates are clearly improved with new drug cocktails, proving a consequent OS advantage is difficult and especially challenging given the large numbers of patients and the long duration of follow-up required. However, based upon response rates, depth of response achieved, and PFS as surrogates, 3-drug cocktails are currently the modality of choice in clinical practice, with use of RVD, CVD, or VTD as the most commonly chosen regimens outside of clinical trials. Transplantation is a useful modality helping achieve or consolidating CR. But is it necessary to provide any consolidation chemotherapy before transplantation? If the patient is going to proceed to transplantation, when do we implement the transplantation. However, because the goal of therapy is to maximize the depth and duration of remission, induction therapy can be continued in some patients for as long as the patient is responding and tolerating therapy, which might be instead of transplantation. Generally ASCT is the primarily way of transplantation. Allo-SCT should infrequently be performed outside of clinical trials, as the risk of morbidity and early mortality of even nonmyeloablative transplantations is considerable. Question one is whether to offer any consolidation chemotherapy before transplantation. After initial induction thrapy, the subsequent approach is to provide further 4 to 6 cycles of induction threapy, then proceed eligible patients to ASCT. The reason to use stem cell transplantation is to provide a consolidation of remission after obtaining the best possible response to frontline treatment. But a controversial area is what to do if the patient has already achieved a CR before transplantation. In this decision, the role of continued chemotherapy treatment versus proceeding to transplantation is less clear and an are of active research. Generally, in practice we prefer to proceed patients to transplantation without any further induction chemotherapy. The reason to proceed to transplantation even achieving CR before transplantation is that current measures of CR are insufficiently sensitive and residual disease is in many, if not all, patients present but below the level of detection. Question two is when do we offer stem cell transplantation to our patients who are eligible to this procedure. The timing of ASCT is also an area of active research. Patients are usually more fit for intensive therapy early in the course of the disease, but prior studies using conventional chemotherapy as induction demonstrated this a delayed ASCT had no adverse impact on OS and is feasible as part of salvage therapy in first relapse. Clinical studies found thalidomide maintenance to improve overall survival. Lenalidomide may offer the same advantages with less toxicity. Generally, it has become our practice to use maintenance routinely when patients have not achieved a CR after stem cell transplantation or when genetic risk markers suggest a very high risk of early relapse. Generally there are two primary techniques for health providers and patients to evaluate the effectiveness of the management plan on glycemic control: patient self-monitoring of blood glucose or interstitial glucose, and A1C. What should be emphasized is that A1C has a strong predictive value for diabetes complications. Hyperglycemia defines diabetes, and glycemic control is fundamental to the management of diabetes. Poor controlled hyperglycemia is correlation with diabetes complications such as microvascular complications and cardiovascular diseases (CVD). Many studies and trials proved that the greatest number of microvascular complications would be averted by taking patients from very poor control to fair or good control. Compared with standard glycemic control (e.g., target A1C <7%), intensive glycemic control (e.g., target A1C <6.5%) seems to have more benefit on the onset or progression of microvascular complications, with further reduction in the risk of microvascular complications. Despite these confirmed benefit of intensive glycemic control, the risks of lower glycemic targets may outweigh the potential benefits on microvascular complications on a population level when given the substantially increased risk of hypoglycemia. Thus, lower glycemic target is appropriate in selected individuals such as those with short duration of diabetes, little comorbidity, and long life expectancy, as long as significant hypoglycemia dose not become a barrier. CVD, a more common cause of death in population with diabetes than microbascular complications, is less clearly impacted by levels of hyperglycemia or intensity of glycemic control. Studies about this topic are inconsistent. In the DCCT, there was a trend toward lower risk of CVD events with intensive control, and in 9-year post-DCCT follow-up of the EDIC cohort participants previously randomized to the intensive arm had a significant 42% reduction in CVD outcomes and a significant 57% reduction in the risk of nonfatal myocardial infarction, stroke, or CVD death compared with those previously in the standard arm. During the UKPDS trial, there was a 16% reduction in cardiovascular events in the intensive glycemic control arm, although this difference was not statistically significant, and there was no suggestion of benefit on other CVD outcomes such as stroke. Conversely, results of three more-recent large trials (ACCORD, ADVANCE, and VADT) suggest no significant reduction in CVD outcomes with intensive glycemic control in these populations, who had more advanced diabetes than UKPDS participants. All three of these trials were conducted in participants with more-long-standing diabetes (mean duration 8-11 years) and either know CVD or multiple cardiovascular risk factors. However, the benefits of intensive glycemic control on CVD primarily rests on long-term follow-up of study cohorts treated early in the course of type 1 and type 2 diabetes and subset analyses of ACCORD, ADVANCE, and VADT. Lowering A1C to below or around 7% has been shown to reduce microvascular complications of diabetes, and if implemented soon after diagnosis of diabetes is associated with long-term reduction in microvascular disease. Providers might reasonably suggest more stringent A1C goals (such as <6.5%) for selected individual patients, if this can be achieved without significant hypoglycemia or other adverse effects of treatment. Appropriate patients might include those with short duration of diabetes, long life expectancy, and no significant CVD. Severe hypoglycemia should be avoid with efforts. Providers should not aggressively attempt to achieve near-normal A1C levels in patients in whom such a target cannot be reasonably easily and safely achieved (with history of severe hypoglycemia, limited life expectancy, advanced microvascular or macrovascular complications, extensive comorbid conditions, and those with longstanding diabetes in whom the general goal is difficult to attain despite DSME, appropriate glucose monitoring, and effective doses of multiple glucose-lowering agents including insulin), where a less-stringent A1C goals (e.g., <8%) might be appropriate. Table 1 Summary of Glycemic Recommendation for Many Nonpregnant Adults With Diabetes.